Local professional boxing once again received a boost from Manny Pacquiao’s conquests abroad. Boxing promotions will continue to grab sports headlines throughout the country. Fight aficionados will be focusing their attention on the contenders and where they are going. AJ Banal – A 17 win, 1 draw and one loss record in a three year pro is not bad at all. Unfortunately, the lone loss happened in front of a Cebu Coliseum crowd. AJ’s road back to top contender status will depend on restoring his confidence and fixing his flaws. He feels he burned himself out by starting too fast and furious during his ill-fated title shot. He also needs to mature psychologically. 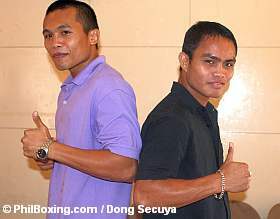 The road back will start on January 31 in Tagbilaran City against Indonesia’s Nouldy Manakane. Czar Amonsot – Now that the ill-effects of his war with Michael Katsidis are behind him he will need a few tune ups before getting back into the ring with a real world ranked contender. He is still 23 years old and there is still room for improvement. He will also be seeing action this Jan. 31 against Zoel Fidal. Czar also dreams of facing Katsidis again in the ring. Bernabe Concepcion – Is he the Real Deal? He has already won the WBC Youth superbantamweight and NABF superbantamweight titles. He even has his own TV commercial. His fights are a staple on youtube.com including his dramatic 8th round KO win over Giovani Caro in a brutal fight where Concepcion’s eyes were almost closed. His record is 27W – 1L – 1D, 16 KO’s and he will be facing Sandy Otieno of Kenya at the Araneta Coliseum this Sunday, Jan. 11 for the vacant WBC international featherweight title. Will he be holding a legit world title belt in the next two years? Roberto Gonzales – This bantamweight turned pro last year but he has already attracted the attention of boxing fans watching CS-9’s weekend fight program “Saved by the Bell”. It’s not just because of his two-fisted power punctuated by a naturally leveraged left hook but also because his opponents go down like someone dropped a sack of marble on their heads. His training regimen includes using coconuts to toughen his abdomen. He is still a rough cut but a diamond nonetheless. Keep on eye on him once the competition gets tougher. Milan Melindo – In this part of the world great things come in small packages. Melindo (17W – 0 L, 5 KO) stepped up to the plate last year winning over Carlos Melo of Panama for the WBA Intercontinental light flyweight title. He also holds the WBO As-Pac minimumweight title. Is he ready to fight stiffer competition? Ex-champ Muhamad Rachman of Indonesia perhaps? Melindo is scheduled to fight again this February with his opponent still to be determined. Will he follow in the footsteps of great Pinoy “small” men like Pancho Villa and Dodie Penalosa? Marvin Sonsona – Is he just another hard hitting southpaw from Gensan? Sonsona (10W – 0L, 9 KO’s) holds the WBO Asia-Pacific Youth Flyweight title is an exciting attacking machine. His fights have yet to go beyond five rounds. He will need to face tougher foes for us to know if he is truly “Marvelous”. Anthony “Rocky” Marcial – he holds a WBO Oriental superfeatherweight belt. Don’t blink or go to the can when he fights. He has a KO record of 90 percent with his opponents lasting an average of two rounds. But he will need to face someone who can take his punches and take him into the later rounds for us to know if he is made of sterner stuff. We expect to witness more exciting fights this year. Aside from the Bohol fight card, fans can look forward to the continuing Summit Fight Night Boxing Tour which will feature Yukka Gejon at the Gaisano Country Mall during the Sinulog, Jason Pagara defending his R.P. lightweight crown in Cagayan de Oro, Z “The Dream” Gorres moving up to bantamweight this February and WBO World miniflyweight champ Donnie Nietes invading Mexico. Top photo: Comebacking ALA Boys Czar Amonsot (L) and AJ Banal pose during yesterday's presscon at the Sugbahan Restaurant in Mandaue City as return to action on Jan. 31 in Bohol.